Have we hooked you? The membership fee is only $35 a year. Membership is open to anyone interested in rug hooking: beginners to advanced rug hooking fiber artists. Weekly Guild meetings give you a chance to enjoy fellowship, fun, the freedom to create anything you wish and the possibility to share tips and techniques. Drop in to on one of our hook-in meetings, from September through May, except during Christmas break. Check Events Calendar for our schedule. 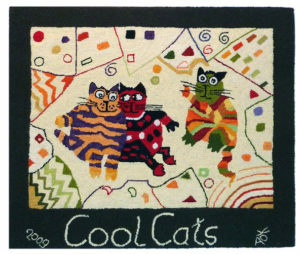 Comme and see us at work and discover the world of rug hooking, no strings attached. and get ready to join us and start hooking the following Monday or Saturday! Visit us, e-mail the President or use the Contact Form!